Blessed Feast to you all! Jesus was captured and taken to Pontius Pilate. There, since it was Passover, Pontius Pilate was going to release one of the prisoners. He asked the crowd "Whom shall I release?" The crowd answered "Barrabas!" Then Pontius Pilate said "What shall I do with Jesus?" The crowd answered "Crucify Him!" Jesus was beaten until He bled. And He was given a crown of thorns. Jesus was given a heavy cross to carry. 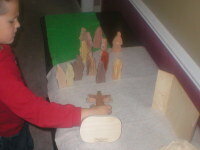 He carried His very heavy cross up a steep hill. 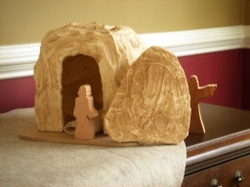 He was taken down from the cross and He was wrapped in linen. And was placed in a tomb. 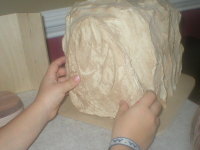 With a stone rolled across it. Similarly, the better-known prayers of the Church's tradition should be recited in Latin and, if possible, selections of Gregorian chant should be sung. It's no secret that we have a bit of a "start and stop" relationship with Latin around here. The same tow-headed boy who groaned on the way to Fr. M's Latin class when he was twelve, has now informed us that he desires a Classical Curriculum in college. Alrighty then. And the only thing he'd change about his home education? More grammar. Who knew? Alas, God, the Pope, and Michael are telling me it's right and good to learn Latin (and Greek, but that's a different post). And we will. But I'm putting away the Latin books until next fall. Then, someone else can help me teach. In the meantime, and most urgently, in light of the above quote, I'm going to buckle down and learn these prayers with my children. I am so blessed to be a parishioner at a church which has been working towards this for eight years. The Latin curriculum for the foreseeable future in this house is A Guide to Gregorian Chant by Rosemary Renninger. This CD comes with a very complete liner with the entire texts of 25 common chants used throughout the liturgical year. Prayers are spoken and then sung using Roman liturgical pronunciation. The spoken tracks are clear and lyrical which aids memorization. Truthfully, it isn't my children's favorite CD, but I'm counting on them thanking me later! For as long as we've been a "Real Learning" household, religious education has taken place largely within the context of the liturgical year. The cycle of feasting and fasting, the celebration of the life of the Lord, the joy of the communion of saints--all have richly blessed our life as a family and all have richly educated our children in the truths of the faith. My children are sensitive to the changing colors and the changing seasons of the life of the Church. 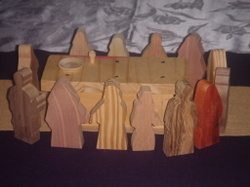 For Advent--one of the purple seasons--we have a multitude of well-established traditions in our family. Advent is full and rich and somewhat predictable. The children know we go from St. Nicholas to Our Lady of Guadalupe, to St. Lucy and so on until we arrive at the Christmas Vigil. It's a lovely, tradition-filled, rhythmic season. We have far fewer traditions for Lent, far fewer markers along the journey. I have several atrium presentations and each year, we wonder together over the days leading to the Passion. But I was looking for something more--something visible and tangible and steeped in tradition. Two of my children have Orthodox godparents. Every year that I can remember, the Orthodox Pascha has fallen on a different date than the Roman Catholic Easter. This year, the calendars line up. And this year, Katherine has blessed us with a beautiful look inside the Eastern church. A perfect rabbit trail! I can use those those beautiful ancient Lenten traditions and the icons that go with them and together with my children, we can learn about the history of the early church and the life of our Lord. We played a little catch up. Using Katherine's essays on the five Sundays leading up to the Lent, we looked anew at Zaccheus. See, there he is up in that tree. Those essays are no longer available, but similar essays appear in Great Lent. We studied the icon of Zaccheus and then colored one of our own. Each of the older children wrote a narration of the story and then a meditation of their own for their liturgical year notebooks. And so it followed for each of the five Sundays leading up to Lent.Each icon is lesson unto itself, a lesson that deepens every time we look at it. But this isn't the lesson of a catechism book, nor is it a work of art. The lessons in the icons sow the seeds of prayer. The idea here isn't so much to illuminate our minds, as to touch our souls. We learned a great deal about the stories or the saints depicted to be sure, but the knowledge isn't for knowledge's sake--it's to bring us deeper into the icon and so into a deeper union with the mystical truths that are there. We've read before the story of the Publican and the Pharisee, of the Prodigal Son, of the Last Judgment, but this year, we learned to look at those stories anew with the icons as our windows. 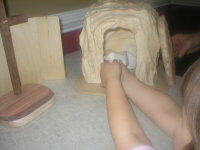 In true rabbit trail-, real learning-style, we are going to continue our studies throughout Lent. The icons will be our curriculum. We'll look at the creation of man and his expulsion from Eden, the road to calvary, the ladder of divine ascent, all from a contemplative perspective. Just as we approach the works in the atrium, using physical objects and figures with a reverence and a sense of wonder, we will look to the icons in a spirit of prayer. How to Pray with Icons is a little book I ordered from Seton Home Study. There are colorful icons as well as explanations of gospel events and brief prayers. The emphasis is not on art--indeed, I will use something entirely different for picture study to emphasize this to my children--but on icons as windows into heaven. The Story of Icons is a truly beautiful book that takes the study much deeper than the book above. It's a natural for those of us who want to more after first experiencing this gateway to heaven. 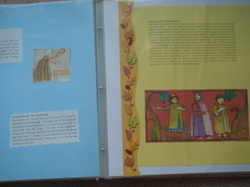 Of course, one of the first books I turned to when I began planning this study was Brother Joseph The Painter of Icons. Brother Joseph is truly a living book on iconographpy, because adults and children alike read it and are drawn into to the story of the creation of icons. I also ordered The Icon Book and several other icon coloring books. I think that in coloring these icons, even my very oldest children will gain an appreciation for the truths they tell. With the coloring books, I did splurge and buy some new colored pencils. Crayons just won't do these justice. Duplicate sets of Icon flash cards make a nice matching game and give the children even more to look at and contemplate. Paidea Classics offers icon ornament kits for Sundays during Lent and Holy Week. I see the introduction of icons into my home to be as exciting as the introduction of the atrium materials for the Catechesis of the Good Shepherd. There are striking similarities. Both are tangible, touchable, visual methods of wondering with a child about God. Neither of them get between God and the child. Both of them encourage the child to go again and again to the same "presentation" and to come away with a deeper personal meaning each time. Finally, both have as much potential to impress a truth upon the "teacher" as they do to impress the child. The dictated or written narration of the story told with an icon, together with a meditation or prayer written by the child is more than enough "academic religious education" and these pages become priceless personal notebooks. Usually, a rabbit trail in my house includes reading for me. I have found that my own passion for (or at least interest in) a subject makes a big difference in how well it is received by my children. We are all learning together. 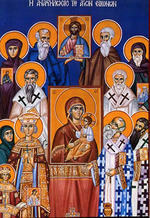 So, Michael and I will begin with the icons and then delve a little deeper into the early church as well. I've linked all my lenten reading on the sidebar to the right. Incidentally, Mike Aquilina has a blog that offers daily food for thought from the early church fathers. 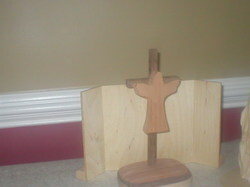 As we progress through Lent, towards Holy Week, we will have personal encounters with visual reminders along the way. We'll look carefully at the triumphant journey to Jerusalem, both with icons and with carefully chosen figures and felts. We'll talk about Christ's great love for us as the bridegroom of the Church. On Wednesday, we'll discuss the sad betrayal of Christ by Judas. On Holy Thursday, our thoughts will turn to the icon of the Last Supper, the Mystical Supper, and to the presentation of the work in the atrium that we call "The Good Shepherd and World Communion." On Good Friday, we will ponder His passion. The children will enter into the work of the atrium and see Jesus as He is hung on the cross and then they will carefully, lovingly, take Him down and put Him in the tomb. On Easter Sunday,they can rush to the tomb and roll the stone away! They can gaze in wonder for as long as they like at the Resurrection of Our Lord! Many, many thanks to Katherine for her generous contribution of time and knowledge towards my education in designing this study for my family. Helen sent me a little red book in early December that has captivated me. It's called Achieving Peace of Heart by Narciso Irala, S.J. The book is a compelling guide to mental and emotional health and happiness. I hope to write about it later with regard to the sage spiritual advice found there. In the first few chapters, however, what struck me is how much Fr. Irala sounded like Charlotte Mason. His antidote to the exhaustion and confusion of our fast-paced world is to slow down and concentrate fully on one thing at a time. He wants us to cultivate what Miss Mason calls the "habit of attention." I've been thinking hard for over a month now about this call to simplicity and concentration. And I can see how the last year has really been an advent of sorts. It's been a preparation for a serious commitment to simplicity and attention in all aspects of life--from the spiritual to the academic. While I will certainly share more about peace of heart, right now, my thoughts have been most definitely on peace of education. The process--during advent,no less--of reflecting upon Michael's education and preparing college portfolios has given me ample opportunity to assess what works for our family. Charlotte Mason education works. It's academically sound and produces a well-educated child. It is a peaceful, integrated education. The Domestic Church works. A fully-integrated life of prayer at home with our spouse and our children, celebrating the liturgical year and the life of the church gives children spiritual peace of heart. That's it. Living books, narration, nature study, Latin (yes, I said Latin--stop laughing, MacBeth). And God, real and present and tangible. I got this one from Mike Aquilina. 1. Favorite devotion or prayer to Jesus? The Infant of Prague Novena. 2. Favorite Marian devotion or prayer? 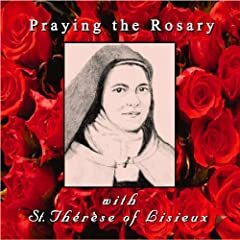 The Rosary. I shoot for twenty decades a day and I still can't adequately articulate its effect on my soul. 3. Do you wear a scapular or medal? I wear the scapular medal (purchased in Chicago at the Shrine of St. Therese) because I am truly allergic to wool and an Our Lady of La Leche Medal sent to me by my friend Mary. 4. 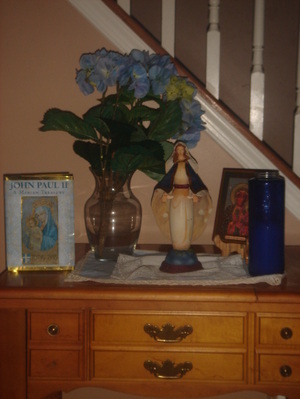 Do you have holy water in your home? Yes. I like to collect Holy Water fonts. I also have Lourdes water in my medicine chest. 5. Do you offer up your sufferings? Yes, though I still don't truly, truly understand it. 6. Do you observe First Fridays and First Saturdays? No. But First Friday is a goal this year. 7. 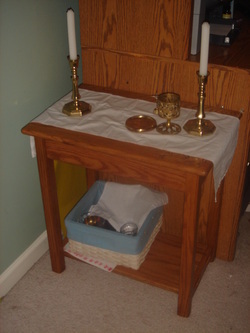 Do you go to Eucharistic Adoration? How frequently? Not nearly as often as I would like. One of my latest lamentations is how long it takes to get to church. When we first moved here, it took eleven minutes. Now, with traffic, it can take as many as 45 minutes. Problem is, you can never know exactly how long it will be because the traffic is unpredictable. I'm trying to figure out how to schedule to get there more often. 8. Are you a Saturday evening Mass person or Sunday morning Mass person? 9. Do you say prayers at mealtime? 11. Can you recite the Apostles Creed by heart? 12. Do you usually say short prayers (aspirations) during the course of the day? Absolutely, all day long. Lately, my days are heavily sprinkled with prayers of thanskgiving. 13. Where is your favorite place to pray? At the Basilica of the National Shrine of the Immaculate Conception. 14. Bonus Question: When you pass by a automobile accident or other serious mishap, do you say a quick prayer for the folks involved? Tag: Kim, Katherine and Helen. Rejoice and be glad for yours is the kingdom of God! As a devout Catholic family, we are open to life. We've always been open to life. Because of God's great grace (and a courageous priest--thank you Fr. Lyle), I will never look back on our years of fertility and wonder if God had more children in mind for us. We greedily accepted all those that were offered. But it has certainly gotten more difficult. Oh, not that we want them less. If anything, I want them more. My prayers for the blessing of children have reached a fevered pitch of desperation as I confront the reality of my forties. Please, Lord, send me more before it's too late! What has become more difficult is the recognition that this is a fallen world and that all our joy is bittersweet. I offered my labor for a dear friend who had recently confided that she was pregnant again, two years after a heartbreaking stillbirth. Throughout labor, I was painfully aware that life and death are but a breath apart. And I was overcome with fear. It was a fear that my friend knew all too well and one that she had faced when she embraced life once again. A few weeks later came the heartbreaking news that her newest baby would also be born into heaven before she ever held him. As I cradled my newborn and wept for my friend, I wept for myself as well. 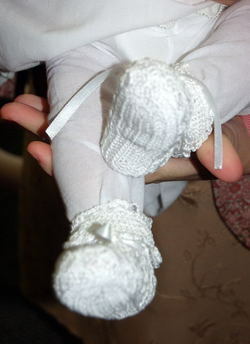 Gone was the nonchalant innocence, the notion that if we want a baby, we can have a baby. In its place is the awe-filled recognition that life on this earth is very precious indeed. And that openness to life--conception, pregnancy and childbirth--is also openness to exquisite pain. My phone rang several times that night and the next day. The news of this latest loss rocked the worlds of some very steady, faithful women. We needed each other--we needed to sort the feelings of loss and pain and hopelessness. And we need to be reminded by each other of faith. Like so many candles lit from a single flame, we consoled each other, we held each other up, even as we mourned the loss of the little row lights that had been snuffed too soon. I talked with my pastor about it all last Sunday. And he said to me, in his forthright, blunt, German way, "It's not about you. It's not about your friend. It's about the baby. Sometimes women forget that the whole idea is getting a new soul to heaven. That baby's there. Mission accomplished." He went on to say that I might not want to be so blunt when I spread the message, but that that really is the bottom line. New souls for heaven. And with that reality ringing in my ears, I had the holy privelige of bringing another baby before God to be baptized this week. Choosing a date for Karoline's baptism was tedious. My husband's travel schedule and the priest's schedule and the Holy Day schedules all bumped up against each other. I ended up with a date two weeks later than I wanted. I ended up with All Soul's Day. And I wasn't thrilled with it. Seemed sort of morbid for a baptism. But yesterday, in that church, I prayed for those women whose lives and whose stories were so much a part of my pregnancy--for Missey Gray, the homeschooling mother of five who died in childbirth last winter and for Nicole, a dear friend who learned she was dying of cancer as she gave birth to her third baby. And I prayed for Donna, who gave another baby to God. And then, there was Betsy. So much pain mingled with such utter joy. Birth and death, saints and souls, truly life in the Catholic Church. And that water, that holy water, looked to my eyes to be the tears of those mothers who so loved their children. Please God, just grant us the grace sufficient to do your will with these precious souls. I listened as the dear priest who has baptized all my children reminded my husband and me again that the goal is heaven and that we were solemnly promising to pass on the faith and to educate our children for heaven. Heaven. No matter whether we hold them for a lifetime or hold them not at all, the goal is to return them to God. 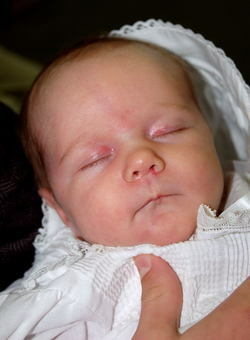 And so yesterday, this precious, precious baby girl became what she is, a child of God. Please Lord, let me always remember that she was created for heaven. I've received several requests for a more detailed resource list for Confirmation preparation. This is a resource list for the Confirmation notebook. Please bear in mind that this is a two-year project. Some of the books have more mature content than others but are wholly appropriate for young adults on the verge of Confirmation. I begin with the less intense books and move to the others. The success of this preparation rests solely on lots of discussion. When to begin preparation is really a matter of the parents' discretion. Some children will not be ready for this kind of study before they are well into the teen years. Others will begin to ask questions and initiate discussions that indicate their readiness at twelve or thirteen. 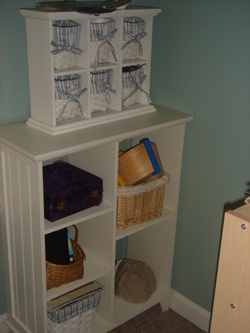 There is a growing box of books and assorted curricular materials in the large walk-in closet that is our home library. In it, materials I have purchased but no longer use (or may have never used) are being gathered to sell or donate. For now, though, it stands as a staunch reminder not to buy, sight unseen, every good idea about which I read. Often, one person's good idea becomes my bookend. Instead, when purchasing curriculum, it is better for me to sit here one day--or maybe for several weeks-- and think to myself, "I wish there were a book that did___"
For more years than I can count, I have thought, "I wish there were an organized way to integrate the Liturgical Year, great literature, notebooking, copywork, simple crafts, and Catechesis of the Good Shepherd." Such a project was daunting. 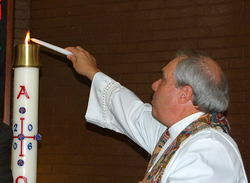 In order to pull it off, one would have to be immersed in living the Liturgical Year. One would have to spend hours researching the wealth of beautiful religious picture books available out there "somewhere." One would have to have a grasp on the concept of notebooking and a sense of how the faith is taught in a Montessori atrium. Then, one would have to make the time to put it all together in a useable format. Some of us dreamed of a such a resource. One of us did it. Cay Gibson, together with Hillside Education, has done a masterful job of creating a lovely, living mosaic of literature-based catechesis--a Catholic Mosaic. When a child learns the faith within the context of the Liturgical Year, "religion" becomes a living, breathing part of the rhythm of life. It is integrated into her being as fundamentally as a heartbeat. In early December, she just knows it is Advent; that's the way it's always been. She thinks, "Our color is purple because we are waiting, preparing." She looks forward to celebrating the feasts that are nestled in among the fast. St. Nicholas, Juan Diego, Our Lady of Guadalupe, St. Lucy--all her favorite, familiar friends are met with joy. And when she is older, she will not merely turn the calendar to the last month of the year inside a dry, secular cubicle, she will instead continue to live the richness of the first season of the Church year. And if, for some sad reason, she does not, something will seem terribly out of sync, for that will not be the normal, habitual beating of her heart from the beginning when she was a child in the Domestic Church of her parents. When the faith is taught within the context of living books a lyrical song is sung, a beautiful image embossed upon a child's soul. Those carefully chosen books become family traditions. "This is the book we read for St. Brigid's feast; this for John Paul the Great's birthday; this for Pentecost." Children learn the stories of the saints and they develop real, living relationships with those holy men and women who cheer them from heaven and intercede on their behalf. The saints of those stories are faithful friends for small children who grow into spiritual giants and guides for well-formed adults. The books Cay has chosen are of the highest quality--living, breathing books that will infuse children and the adults who share them with the breath of the Holy Spirit. When notebooking is introduced to the teaching of religion and academia meets theology in the context of the rhythm of the household, you have real learning. No one can tell where "school" stops and "church" begins, where "church" stops and family life begins. Instead, there is a lifestyle of learning within the heart of the Domestic Church. It is education within the bosom of the family, just as the Creator intended. Catholic Mosaic offers a plethora of ideas for organizing just such an education. It's all tied together and keyed to the calendar. We can do this! We can have an environment in our homes that is this rich and meaningful! There will be no used copies of this resource available. Mothers who forego home education to send their children to school will hold on to this book in order to read the stories at bedtime and do the crafts on rainy Saturdays. Mothers whose children have grown and gone will pass the book to their daughters and daughters-in-law. It is a resource destined to become dog-eared and jelly smeared. At 4Real, we've embraced this resource with great zeal. We are talking about it. 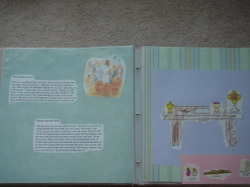 We are adding more books and more ideas and we archiving the success stories. Come join us. We are piecing together a life in our homes that is reminiscent of a mosaic in a fine cathedral-- something truly rich and beautiful for our Lord. There's been much hurrying and scurrying in the Catholic homeschooling blog world these days. 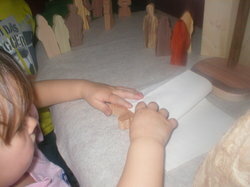 Under the tutelage of Alice in the Cottage, much crafting is happening to honor the Blessed Mother. The flurry of activity is amazing and much of it is being discussed on the 4Reallearning Boards . There is a Marian notebook project, a lively discussion of crafts, devotions, and gardens, some talk about the legends surrounding Mary's flowers, and a hunt for Marian images. May 5th! That's today! It is as if our dear Papa reached down, patted my head and said, "Take a deep breath, May is one of the long months.And it's just begun!" Sigh. A long month; we've plenty of time! I couldn't find the small shelves Alice described, so we got one long shelf to create our Mary shelf. They cut up old Christmas cards and decoupaged the top of the shelf and then painted flowers on the face of it. 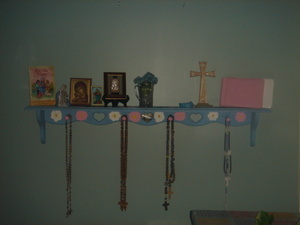 On it, the children have hung rosaries and displayed the rosary books they've been working on. They collected all things Marian from around the house and made a small holy water font from Sculpey left over from our ornament project (photos of that to be posted some other day in this long month of May, after the ribbons are tied and I actually find a silk tree and many more images). The Mary Garden is really taking shape. Today, the girls planted Alyssum. 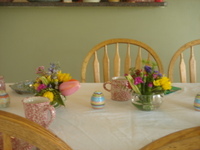 Mary Beth has posted some lovely pictures on our family's nature blog, Blossoms and Bees. Dawn, of Marigolds for Mama, tells us that Alyssum is also known as "Blessed by Mary" or "Mary 's Little Cross." They are such sweet flowers that I caved and broke my "no annuals" pledge. We planted three flats of them! It's a long month of celebration. A month of glorious reflection on the young woman who said, "Yes!" to the will of God. A month to draw ourselves closer to the Blessed Mother and--even as we bustle about our own households and we are the grownups who make things happen in our homes--to snuggle into the mantle of the Gentle Mother, inhale her sweetness, and be like little children safe in her arms. We awoke this morning to a chorus of Alleluias! The stone was rolled away; He is alive! And, after the fast, of course, we must feast. The table is set. We discussed the menu on The 4Real forum, but the children and I tweaked it a bit today. 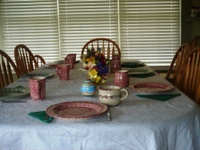 To see pictures and more recipes, visit Kitchen Comforts. Jesus said, "Amen I say to you, one of you will betray me, one who is eating with me." They began to be distressed and to say to HIm, one by one, "Surely it is not I?" He said to them, "One of the Twelve, the one who dips with Me into the dish...It would be better for that man if he had never been born." I have been discouraged this Lent by my inability to DO all the things we usually do around here during our season of preparation. I just haven't been able to prepare to prepare. Sometimes, we choose our Lenten sacrifices. Sometimes, God chooses them for us. Lent began early for me this year, shortly after the Feast of Mary, the Mother of God. I didn't even know I was pregnant, but boy, did my body. I haven't been upright for more than a few moments at a time since. This is my fifth autumn baby; I'm beginning to get good at giving up all eating as I know it for Lent! I'm also learning that I can be a good mom just by being, not always by doing. We've done a lot of snuggling, had a lot of heart-to-heart conversations. Still, I miss the Lenten preparations. It's the DOING that I've sacrificed. God sends us people to help carry our crosses, too. 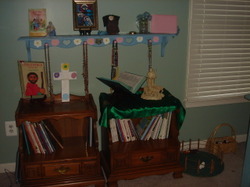 Stephen's Godmother has come in (a bit like a lady with a magic wand) and tied purple ribbons on all our religious art. She also cooked and cleaned:-). Everywhere we look, we see simple reminders of the season. And early yesterday morning, I prayed for the strength to just do the important things. 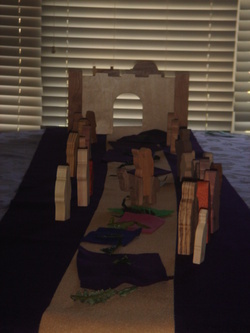 Lo and behold, I finally got around to setting up the first three installments of Jesus' Journey to Jerusalem. It's all I did for the day, but it was wonderful to present "Jesus and the Children," "Bartimeus and Jesus," and "Jesus and Zaccheus" for the first time to the littlest ones. Each of them returned to the work again and again throughout the day.One of the most beautiful things about Catechesis of the Good Shepherd (Montessori's approach to religious education) is the spiritual benefit for the catechist. Every time I present a work, I gain a new insight into that component of our faith. And every time I wonder aloud with my children, I understand why they are God's plan for my journey to heaven.